A string of brilliant round cut diamonds press into diagonal faceted pockets on this antique wedding band. Delicate milgrain decoration outlines the intricate design. The sides and back of the band are decorated with stunning abstract engraving. 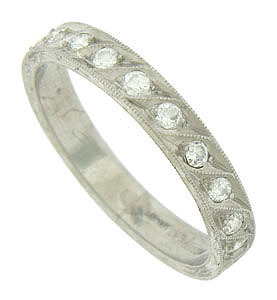 The Art Deco ring is fashioned of platinum and measures 2.76 mm in width. Circa: 1920. Size 6. We cannot re-size.